Mac vs. PC: The Mac or PC argument has raged for many years between home computer users! Forget Star Wars – think Computer Wars when it comes to Macs and Windows PCs. Sure, there are other operating systems such Ubuntu, the Debian-based Linux OS, but these are way in the minority. Here, however we are fundamentally discussing Apple Macs with Windows PCs. So let’s enter the fray!! What Are We Discussing and Comparing? We are comparing here the Apple Mackintosh Mac OS or OSX system, running on MacBooks or iMac, with Microsoft’s Windows OS running on what are colloquially known as PCs (short for personal computers, although Macs can also be referred to as ‘personal computers’). Such PCs are marketed as Dell, Toshiba, Lenovo, HP and many others. It is easy to boot up into 32 or 64-bit Windows 10 on a Mac because OS X has the drivers required readily available with its built in ‘Boot Camp.’ Mac OS X can run only on Apple Mackintosh machines. It is more difficult to get OS X to run on a Windows PC. Known as ‘Hackintoshing’ a lot depends on the age of your motherboard and other factors. So right away, the Windows operating system holds an advantage over Mac OS X. However, that’s not the subject of discussion – it is which is the better of the two – an Apple Mac or a PC running Windows. Let’s discuss some other differences between the two. If we are discussing OS-compatible software and tools, then the Windows PC wins hands down! However, when comparing compatible software, you must also take into consideration that the Mac has access to apps that can do just about anything you want it to do! Sure, Windows software is wide-ranging and there is a lot of it, but do you need it all? Apple Mac users will say that they have access to all the software or apps they need – so why complicate things by offering too many choices? This is a good question, although a lack of competition for software apps can lead to higher prices – which is the case! Not only are Macs more expensive than most PCs, but the software that runs on them also tends to be more expensive than Windows-compatible software and apps. Apple Macs tend to come second when discussing the compatibility of the hardware with new software releases. PCs are backward compatible – meaning that a new version of Windows can run on an old PC machine. You can load Windows 10 onto a PC you purchased 5 years ago. Macs are not so versatile. Try running Mavericks on a Mac running Snow Leopard and you will be disappointed. You may not even be able to run it on your Lion (version 10.7.5) machine. Apple seems to have decided to neglect Lion and focus on their new versions. You don’t tend to get this with Windows! Many home computer buyers check out the specifications of their purchase, and then like to customize their units to meet their own requirements. They might want to expand their RAM or insert a faster processing chip – or make other types of changes. They cannot do this with a Mac! You may be able to add a disk caddy to give more external hard drive storage, but anything else is almost impossible – you get what you buy and that’s it. You can customize your PC in so many ways that your computer can change completely – run faster, looks better and have more disk storage without adding peripherals that take up UBS slots. You can even update your motherboard. With a Windows computer, you can create a PC that meets all your needs and looks and works just like you want it. With an Apple Mac what you purchase is what you have, with little – if any – opportunity to customize it. The fact that you can purchase a PC manufactured by many different companies, but that Apple Macs are made only by Apple, significantly affects the price of each type of computer. There is no competition between Apple hardware manufacturers, just Apple, so Macs can charge what they like. Competition between PC manufacturers running the Windows OS tends to drive prices downwards. There is one advantage that Apple has, and it is that it can create a uniformity of design with their MacBooks, and offer a more stylish machine. This stability in design and uniformity in color and appearance, appeals to many of its users. Everybody can recognize a Mac just as they can recognize a Ferrari – but Windows PCs have so many different designs that there is no distinction, or even prestige, in owning one. Even Mac users agree that there are few doubts that the cost of a MacBook tends to be high for what you get in comparison to Windows PCs. However, Macs are way ahead of PCs for elegance and stunning looks – and if that matters to you then there is no contest. The Mac wins every time! For many, that is well worth the extra cost! Apple is innovative – that is obvious from its approach to its multiple products such the iPhone, iPad, iPod and other devices. Apple has a knack of getting the coolest apps and gadgets to work in sync with its mainstream hardware products – of which the Apple Mac computer is one. However, and this is a large advantage, Windows PC users have access to a massive selection of apps and software developments including large numbers of free releases. PC users have a massive selection of Open Source software and Freeware that they can choose from to carry out almost any task they require. For Microsoft, innovation comes in its various versions of Windows and dedicated software. The Mackintosh OS X operating systems has its origins in Unix. While many may still remember the infamous Morris worm that infected Unix machines back in the 1980s, this OS still remains relatively free of viral attacks compared to Windows. There are reasons for this. Unix has had its fair share of viral attacks, though these were mainly before the Windows era. Operating systems such as Unix and Linux were certainly infected by viruses and subject to attack, but not to the same extent as Windows machines are today. Windows systems rapidly became the most popular for home computing, and in very many cases, also for business networks. This naturally led to scammers and virus writers attacking Windows OS machines because there were more of them! As the PC revolution expanded to PCs and laptops using Windows and almost unlimited Microsoft software applications, there was just one main target for scammers and viral attacks: MS Windows! Apple Macs OS X is ultimately based upon Unix. This inherently offers better anti-viral properties. Although many may disagree, much of the lack of viral attacks on Apple Macs is due to the popularity of Microsoft Windows and the large numbers of vulnerable software scripts and applications written for it. Windows was not written with antiviral features included – on the contrary, unlike OS X, it was very open to vital attacks. If viruses and other attacks on your laptop or MacBook is an issue for you, then the Mac will the better choice. Sure, there are many antivirus services available online, but the most effective of these can cost you a hefty annual fee. That said, Microsoft’s Windows Defender has been found by most users to be sufficient – but not by all. With Windows you rely on software to protect your – with the Mac you have inherent virus protection, though it may not be perfect. 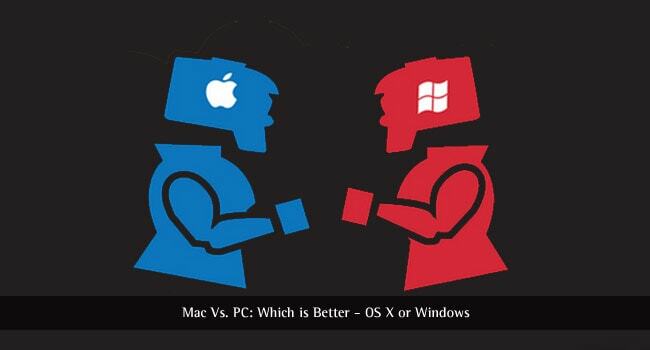 Mac Vs. Windows: Which is Best? In the Mac vs. Windows argument it is difficult to give advice on which is best. Ask yourself what you want your computer for. Is it for home use or business? Is it for design and images or for largely text-based content? If you are creating and editing videos, designing and creating graphics and are focusing mostly on visual content, then there are no doubts that the Apple Mac wins hands down. The Mac vs. PC argument swings towards Microsoft Windows PCs if your main use is for word processing, emailing and web browsing. If you are into web design and website admin and management – then you choose. Each has its own benefits, although there is a tendency for blogs and websites based on Windows to dominate the rankings. There is no correct answer to the Mac vs. PC question. Whether you choose a Mac or a PC depends on a great deal on what you are using your home computer for, and whether or not you want to sync it with your existing Apple devices. Most people go for a Windows PC machine, although many others think the Apple Mac looks more stylish and does all they want of it. The choice is yours. I bought apple macbook pro last year and agree with your thoughts. I also recommend if you want to editing or playing with graphics & video, no doubt go for apple. I was not aware about these Mac vs PC. This is new for me and I’m happy to read this. It helped me a lot to improve my knowledge. I always find that type of post.Thanks and watching further for more post. I have used both Windows as well as Mac and as per my experience I would always go with Mac due to its reliability and it never slows down. Wherein Windows is highly user-friendly but with days it gets really slow and also causes a lot of trouble. So the final part comes to Service and when it comes to customer service. Apple is the best! I am an old guy. When we could get a calculator in school we thought we were on the sly … However, I smell a Windows Rat. Mac is good for coding than windows.